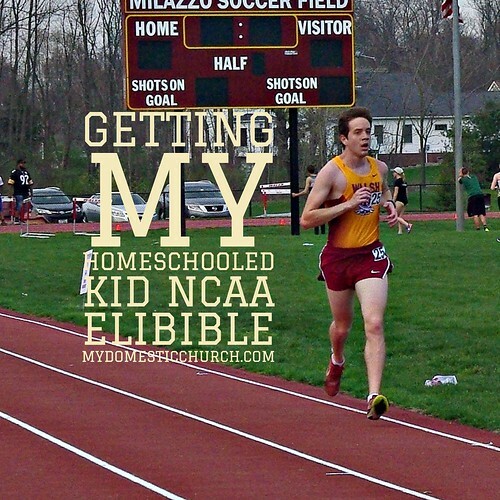 Last year my son, the runner, became a student in a NCAA Division II school. He had respectable ACT scores, he had college credit that he had earned in high school, and he had a high GPA (those were the grades I gave him- which never seem to get the same weight as grades from the public, parochial or charter schools). He easily got into his first choice of college and I patted myself on the back for a job well done. Then I discovered that getting him eligible to run for the cross country and track teams through the NCAA was something entirely different and much more rigorous than getting him into college! I quickly discovered that the NCAA and other experts suggest that you register your athlete early and that keep excellent records so that you can turn them in as soon as possible to get your eligibility. I did not discover this until May of his senior year with hopes of his being able to run with his college team in August. Nonetheless, I was able to get everything done in about three weeks, turned it in and had him eligible to participate with the team when official training started. It wasn't easy, but it was totally worth it. I'll go over that process in another post, but I want to share with you a simple form that I made up to help me with my 7th grader, who also hopes to run on the college level. She is already an exceptional runner at her age, so I imagine that her grades and records will be under even more scrutiny when she goes to apply. This is just a simple reading list. Feel free to print out as many as you need, but start as early as the 7th grade. Simply write the name of the book, the author and the ISBN number (this is required by the NCAA when you go to turn in your paperwork). If you write all of that down now, it will make life so much easier for you in senior year. You also want to write down what course this was for. If it is just a literature book, just write it as part of your English course for that work. You also want to write down the names of all of your textbooks. Finally, indicate which grade this book was completed. You'll need to use some judgment here. If your 7th-grader is successfully finishing a calculus text you might want to write something like 7/12 - finished in 7th grade, 12-grade level. You only want to put books that are high school level or higher on this list, and certainly, all of your textbooks need to be high school level for the NCAA. Grab your NCAA Book list here. Oh, God bless you! I'm having a minor freak out about NCAA qualifications. We have swimmers and are fervently praying about what to do next school year. I'm impressed you managed to pull all paperwork together in three weeks! Thank you for this timely post and I look forward to future post re NCAA. You did not "give" him grades. He "earned" grades. :). I know it is trivial to some, but it is important in academia. Good job on his successful launch!